Last morning in Housekeeping Camp=eat up stray breakfast foods and pack, pack, pack. By this time, my camping cold was in fine form, chiefly manifesting in sniffles. Note that hanta hath no stuffy noses and does not manifest so quickly. All I was doing was infecting the loved ones. 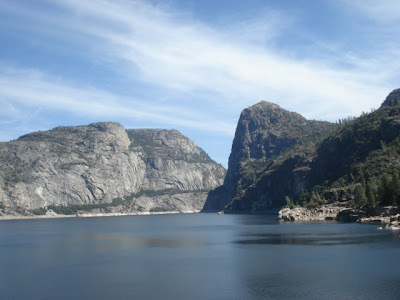 We stuck to the plan, which was to visit Hetch Hetchy as we left. 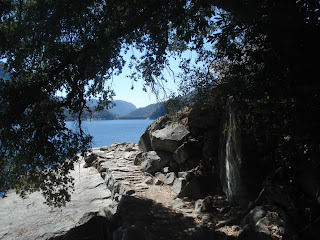 The road to this part of the park is off CA 120, which made it an easy side trip on the way back to the Bay. Sort of. After a tame stretch in the woods, this is 12-ish miles long, mostly midway down another very steep slope, and only theoretically two lanes wide. It would have been hilarious to be safely up-slope on foot somewhere, getting video when two rental campers, going in opposite directions, confronted one another. Fortunately we encountered nothing wide enough to put us off the road. In true tourist fashion the first thing we sought was the rest rooms, which are several minutes' uphill walk from the day parking: another brilliant piece of National Park Service planning. When we got there, we found the doors decorated with recent high bear alert signs. It would have been more useful to have a couple of these at the day parking, since we had just walked away from a car packed with bear bait. After a hasty return to the car, we flagged down a ranger and asked the obvious question: where are the bear boxes? She said there were a number at the camping area, out of sight at the other end of the parking area. Em drove over, leaving us to contemplate the view over the lake, and talk a bit with another ranger. The lake, the entire foreground of the scene here, is man-made and 300 to 400 feet (again, choose your source) deep. That gives you some idea of the scale of the original valley. This is the site of one of the first major environmental conflicts in the United States, at the beginning of the 20th century, one that went to the forces of "progress." 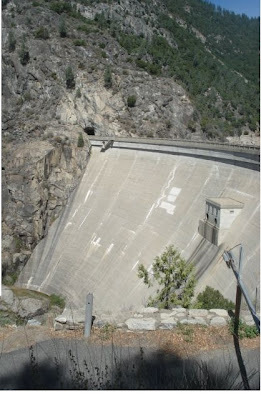 To provide water and power for San Francisco, this smaller version of Yosemite Valley was dammed. The plant from which the location takes its name was obliterated. Although western environmental forces lost this battle, they never forgot the lessons. That's why Yosemite itself, and even (so help me) Grand Canyon have not (to date) been dammed. That's also why there is an active movement to remove this dam. There is equally active opposition, but the conflict continues and may have a reasonable chance of success. Whilst we waited for Em and mused on all this, another ranger came back. We commented that the day parking seemed a tad unprepared for the bear problem. He told us that Hetch Hetchy had been caught somewhat off guard by the largest number of bear incidents in 40 years. One has to reflect that there is a direct correlation between the increased NPS pressure on bears in Yosemite Valley and this increase. It's a 45 mile drive from Yosemite to Hetch Hetchy, Curiously, it's about the same distance, in ish miles, by back-country trail. Bears can cover that distance in a couple of days. We also learned that the pressure on the bears had been caused, naturally, by lawsuits. What Hetch Hetchy also has, and has had for years, is a large and notorious population of rattlesnakes. This seems appropriate, considering the political snakes responsible for the dam, but the ranger admitted his love to nature was stretched to the limit by rattlers. He asked where we were going, and we said Wapama Falls. Like everyone around the park who didn't treat you like an idiot for trying to view the falls in September, this guy apologised for the lack of falls at Wapama. He also said the Wapama Trail was usually where the snakes were, but not to worry: there were quite a few hikers ahead of us and they would likely scare the snakes away. Having done everything but exchange his Smoky Bear hat for a brown fedora, and his radio for a bullwhip, Indiana Ranger departed. Em came back toward the end of this discussion and we headed across the damn dam. There's an uneasy cooperation here between NPS and the dam owners, the San Francisco Public Utilities Commission. The latter has decorated the dam with interpretive signs extolling this triumph of human ingenuity over nature, paeans that probably fell on many deaf ears. 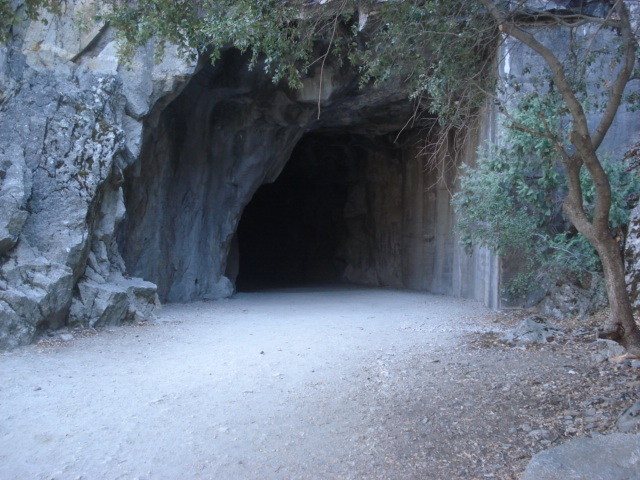 The Wapama Trail starts out in a tunnel, one of those triumphs over nature. Like the Wawona Road tunnel, it's cut through living rock and has little reinforcement. Once through this rather Orkish creation, the views ahead are fairly natural, considering that this piece of the trail started life as part of the dam construction project. All this was a century ago. Absent any sign of rails, the traffic along here must have been waggons or mule trains. About a third of the way out, one begins to see where the snake business comes in. 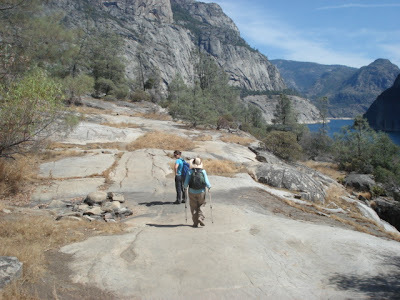 The trail leaves the woods and winds across very bare and very hot ledges. This sort of landscape is very popular with reptiles. It was not so popular with my inner camping child, who was already not happy about hiking with the sniffles. There was still a good deal of trail to traverse, but "are we there yet?" was already coming to the forefront of my consciousness. There were no snakes. I was getting into a frame of mind that would have been very dangerous for the snakes. Em said that we would go as far as "the bridges." My whiny self was inclined to ask if that meant something local, or the bridges of Madison County or the bridges of Toko-Ri. I kept those thoughts to myself, but when we reached a bridge, nicely situated in shade, I flopped against a ledge and finally did ask if we were there yet. No, says the offspring. The bridges are at the foot of Wapama Whatever, where the falls are in wetter season. It's not much further, says she, so let's get going. So we left the nice shade and trudged onward. It really wasn't much further. True to form, the trickle in the shade near the first, shady bridge was the only water in sight not in the reservoir. 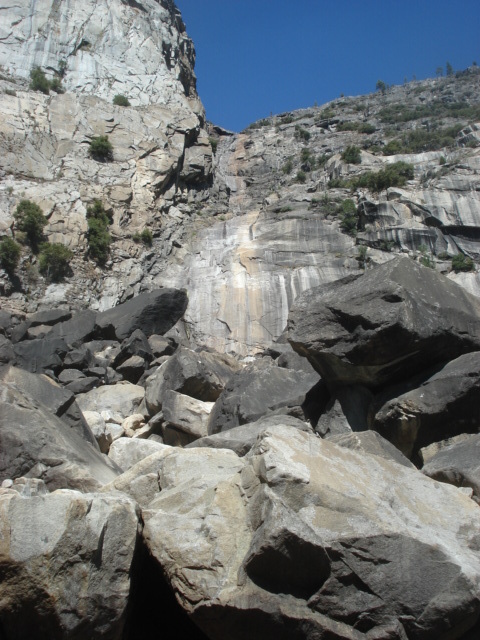 Wapama Wall looked a lot like the water-deprived Lower Yosemite Falls: a jumble of rocks. We were told that in spring the water flow is so intense that people have been swept off the bridges and into the lake, usually in bad shape, if alive. No chance of that today. Next the bridges there was more shade, good scenery and suitable sitting rocks for a break before completing the 5.5 mile trip. By the time we got back and got on the road, everyone had the sniffles and the grumbles big-time, so the flip side lacked a good deal of the sparkle of the outward trip. We were back in Berkeley just after sunset, and I volunteered for the trip to the nearest CVS for cold nostrums. I found that cold remedies were in short supply, since a cold bug was sweeping the city and campus. This offered proof of one of our hypotheses, that we had brought the cold with us. I bought what I could and headed back. For some reason, I usually bounce back from colds rather quickly. Not so wife and child. Both of them are subject to days of mucus overload together with a temp just elevated enough to contribute to misery. Em has no hesitation about treating such symptoms as much as possible, whilst my spouse usually confines herself to Ricola cough drops and Puffs tissues. Em and I ultimately persuaded the uxorial unit to take a 12-hour antihistamine for the trip home, so that she wouldn't offend fellow passengers, or perhaps not be allowed to board. All this canned the proposed trip to San Fran. On Saturday morning my wife and I took a ramble in downtown Berkeley with the local farmers' market as our objective. This proved to be large, varied and quite multicultural. The trip provided lunch on the spot for us and fruits etc. to bring back to Em. She is a regular and commented that the market is one difference between Berkeley and Bakersfield. Here the organic produce really is local. In Bakersfield, the epicentre of American industrial agriculture, organic produce has to be imported. The remnant of the trip was uneventful, although I have again to comment on the comforts of the post-security amenities at the SFO departure gates. At Logan, we were reminded once more that Virgin America is rather an ill-favoured stepchild, when we discovered that VA baggage debouches at the far end of the terminal from the arrival gate. That set up a pattern of slow-fast, slow-fast for the rest of the trip. Getting the bags was slow, but we got a shuttle bus immediately. There was a long wait for a Wonderland train, but we just got aboard a very crowded Marblehead bus, with the usual interesting mix of passengers. With that, this trip was done. 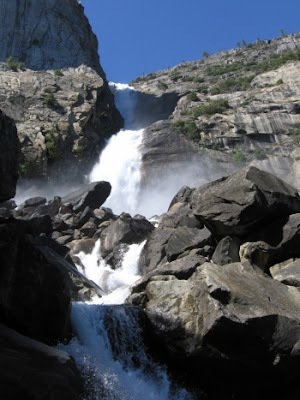 During a recent phone call, Em tactfully suggested we think about fitting a long weekend at Tuolumne into the next trip we make. Assuming I can put off the descent into feebleness, I'm for it.